This is a continuation of my last post, Using PowerCli to Build multiple VMs. After automating the building of VMs, what’s the sense of having to manually add the IP information or updating the VMware tools? It’s pointless. So we need to add the IP information to the CSV file that was used to build the VMs. 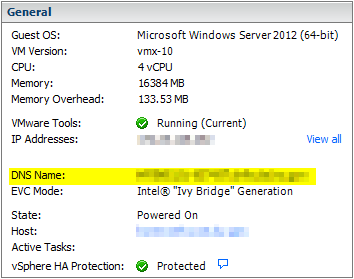 Starting where I left off, the newly built VMs will need to be powered on. That was simple enough. Now the VMs have been powered on, and are running through the VM customization that I set during the build process. So, I need to figure out a way to make sure that the script waits until the system has finished this process before continuing. When I first started this process, I thought about just using the sleep command. Seems good, but what if am “sleeping” the script for longer than I need to, or not long enough? But I tried it anyway, it failed bad, and didn’t work the way I wanted it to. What about waiting for the VMware tools to be running? It has to be running when the OS is booted, right? I just need to wait until the DNS name, matches the name that is in the CSV file. I put this piece into the script, and it worked perfectly. The script waited just the correct amount of time for the customization to complete. $netsh = "c:\windows\system32\netsh.exe interface ip set address ""$NetworkName"" static $IP $SNM $GW"
$netsh2 = "c:\windows\system32\netsh.exe interface ip set dnsservers ""$NetworkName"" static $DNS1"
$netsh3 = "c:\windows\system32\netsh.exe interface ip add dnsservers ""$NetworkName"" $DNS2"
$netsh4 = "c:\windows\system32\netsh.exe interface ip set winsservers ""$NetworkName"" static $WINS1"
$netsh5 = "c:\windows\system32\netsh.exe interface ip add winsservers ""$NetworkName"" $WINS2"
I had to start with authenticating to the guest VM. This script works with multiple different operating sytems, so it needs to be universal. As a result, the first part of the script uses a WMI query to get the network card name, and scrubs the variable into a usable information. Then uses NETSH.exe to configure the network interface. So the line starting with $netsh sets the static IP address, subnet mask, and gateway using the information from the WMI query. Then the next 2 line sets the DNS settings and the last 2 lines sets the WINS. It then uses Invoke-VMScript to push these settings to the VM via the VMware Tools, which is why it so important that the tools are up to date. So the completed script looks like this. $vms = Import-CSV "C:\Scripts\VMWare\VM Creation\NewVMs.csv"
Hopefully that clarifies some of the issues from the last post, and if you have any questions, hit me up in the comments. for testing purposes on a standalone ESXi environment, do i have to change from cluster to host? If you have a single ESXi host you can use the Connect-VIServer to connect to the host and remove the instances of get-cluster from the script. If you have issues, post the part of the script giving errors and I’ll assist with updating it. I am totally new to powershell scripting and want to automate the VM creation in my home lab. I managed to get the first part of the VM script to create a new VM from a Template – all works fine, but when I try to add the second part for setting the IP it seems to be failing in two sections. I noticed the variable using in line 2 – $GC = $Host.UI.PromptForCredential(“Please enter credentials”, “Enter Guest credentials for VM”, “Administrator”, “”) is not referenced in the script and I don’t know where I need to add it. Perhaps you can assist me. Below are the two errors I think these are being cause because the credential have not been passed. Invoke-VMScript : 21/12/2018 19:47:15	Invoke-VMScript	Failed to authenticate with the guest operating system using the supplied credentials. Happy holidays! Sorry for the delay in my response, the holidays are rather busy at my house. I have read your comments and I hope I have answered everything. 1. The variable $GC is used with the lines that start with Invoke-VMScript. This allows for authentication to the guest VM. 2. Just looking at the errors you posted you might need to check out the template you are using as it might be the issues -> https://kb.vmware.com/s/article/2129927. 3. I have a better script for building VMs that you might give a try, link here -> (https://github.com/NotesofaScripter/PowerCLI/blob/master/Building_VMs_using_OSCustomizationSpec.ps1). I hope that this helps, and if you need anything else just let me know.